During the course of this Parliament I have grown used to hearing, and sharing, concerns about Lib Dem-Tory changes to the justice system. The 23% budget cut to the Ministry of Justice, the 50% reduction in capital spending on prisons and 10 000 fewer frontline prison and probation staff leaves our justice system crippled. The most concerning and emotive changes have been the cuts to Legal Aid in the Legal Aid, Sentencing and Punishment of Offenders Bill. Cutting Social Welfare Legal Aid by 68%, a system which saves more money than it costs, turns its back on the principle that the government should protect victims and punish offenders. I have recently received a surge or emails and letters, many from supporters of OXFAM’s GROW campaign, who are concerned with the effects of the Bill on Britain’s commitment to Human Rights globally. The Bill will mean that offending UK companies will no longer have to pay the successive legal fees or the insurance premiums of poor people who rights they have abused. This will make it harder for those victims to find law firms to take up cases. The victims of illegal waste dumping in the Ivory Coast who last year successfully claimed compensation from British oil company Trafigura exemplify this need. My Labour colleagues and I recognise that savings need to be found in the Legal Aid budget but this Bill is the wrong way to go about reform. The Labour Party presented strong alternatives. The last Labour Government’s March 2010 proposals, had they been implemented, would have led to 10% efficiency savings, which would have stemmed from improving the way legal services are contracted from solicitors. The coalition has rejected this option. Around the world the UK champions Human Rights. One of these rights is to a fair trial in an independent judiciary. A situation where citizens here in the UK, and those affected by UK companies abroad, do not have fair and affordable access to justice is wholly unacceptable. I recently met with Nikki McCann, an ambassador from Cancer Research UK to talk about the campaign for plain tabacco packaging. With new laws prohibiting the sale of cigarettes from vending machines and tobacco displays in supermarkets and shops, the tobacco industry is putting more importance than ever on using packaging to make its products more attractive. While tobacco advertising is being made a thing of the past, advertising on cigarette packaging remains a clear anomaly. The British Heart Foundation has just produced a report which thoroughly details just how much of an impact banning advertising on cigarette packaging. In recent years the industry has increasingly targeted young women, particularly through new ‘super-slim’ branding and packaging, with two new ‘designer’ packs launched in 2011. An industry spokesperson commented that their company’s marketing is not aimed at encouraging anybody to start smoking, but is simply trying to encourage existing smokers to switch to their brands. But for a profit-making industry, new customers are essential. As exposed in the BHF report, internal industry documents do not shay away from this fact, acknowledging the need to attract new smokers. The tobacco industry as a result invests significant resouce to innovate the branding on its packaging to attract more people to buy the product. Experimental studies where example plain packs have been used alongside existing brands have shown that plain packaging can help to reduce the appeal of the product. One study looking at adult smokers in Australia found that cigarette packs that displayed progressively fewer branding design elements were perceived increasingly unfavourably by smokers. Similar research in Canada looked specifically at female smokers aged 18 to 25 years old, and found that removing descriptors and colours significantly reduced a pack’s appeal – plain packs were associated with fewer positive characteristics than fully branded packs, including glamour, being slim, popular, attractive and sophisticated. 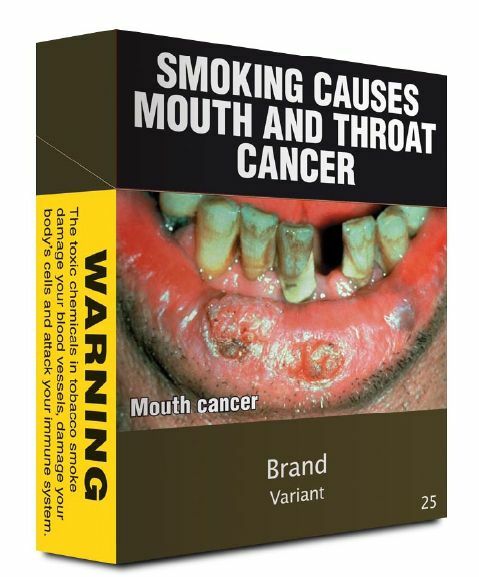 In the BHF’s 2011 polling, 16-25 year olds were asked to compare an Australian-style plain pack with UK picture warnings placed on the front, alongside two existing brands. Over 87 per cent of respondents found the plain packs to be the least attractive, with the reaction stronger among regular smokers with 91 per cent finding plain packs the least attractive. The industry has claimed that plain packaging legislation would represent an acquisition of intellectual property, and as such would contravene various international trade agreements. Under plain packaging, intellectual property of tobacco companies would be retained by those companies. Governments would not intend to use the logos, and tobacco companies will retain full rights to both their logos and brand imagery – legislation will simply prevent their use on cigarette packaging. There is no credible evidence to support tobacco industry claims that such legislation would increase illicit tobacco use, and existing anti-counterfeiting measures would apply to plain packaging. Following consultation with the industry, the Australian plans for plain packaging include placement of a unique alphanumeric code on each pack on a voluntary basis and covert markings including taggart ink, which can only be identified through specialised equipment. Introducing plain packaging would reduce the attractiveness and appeal of tobacco products, particularly for young people, increase the prominence and effectiveness of health warnings, and reduce the ability of packaging to mislead smokers about the harms of smoking. seek amendments to the EU Tobacco Products Directive, to enable large front-of-pack picture health warnings. By introducing plain packaging for tobacco products across the UK, the Government would eliminate this remaining ‘silent salesman’ of the tobacco industry. This would cut off the last avenue for tobacco companies to advertise their deadly products to young people and would uphold the spirit of existing legislation. Over the long-term, this would lead to less people taking up smoking, and fewer people dying as a result of smoking-related diseases such as heart disease. The UK Government should take the opportunity to close this loophole and protect children and young people from the damage caused by tobacco marketing. To see for yourself how cigarette packaginging can influence young people you can watch this video from the BHF. I know a great number of you wrote to me prior to Christmas expressing your concerns about the NHS Risk Register. The Information Commissioner had ordered Andrew Lansley to publish the Risk Register into his NHS reform plans however he had refused to do so. Please find below the response from Earl Howe, Parliamentary Under Secretary of State for Quality at the Department of Health. As you are no doubt aware David Cameron is planning the biggest re-orgnisation of the NHS since it began in 1948. It is an unnecessary, unwanted and damaging reorganisation which threatens to end the NHS as we know it. It is undeniable that Andrew Lansley’s reforms have increased the risk to safe delivery of NHS services. The information in the Risk Register is absolutely crucial to proper Parliamentary consideration of the Bill and it is highly regrettable that Mr Lansley has refused to release it. Labour has launched a major national drive to unite the country in a call on this Government to drop its unwanted Health and Social Care Bill. Aneurin Bevan once said “The NHS will last as long as there are folk left with the faith to fight for it,” well my Labour colleagues and I intend to fight for it. David Cameron has no democratic mandate for this Health Bill. It wasn’t in his manifesto and it wasn’t in Nick Clegg’s either. The public never voted for it and healthcare professionals are fearing it. The fight for the future of the NHS is upon us and I urge concerned people across the country to join our ‘Drop the Bill’ campaign by signing our petition at www.dropthebill.com and getting everyone you know to do the same. 1) The Bill will break up the NHS and create an unfair postcode lottery. With no national standards, there will be widespread variation in the treatments available on the NHS. In some areas people may have to go private to get services available elsewhere. 2) The Bill risks rises in waiting times and a two-tier NHS. It scraps the cap on hospitals treating private patients at the same time as watering down guarantees on NHS waiting time. This means local hospitals will be free to treat more private patients and make the NHS patients wait longer. 3) The Bill turns the NHS into a full-blown commercial market, putting competition before patient care. It allows private companies to cherry-pick quick profits, potentially forcing local hospitals to go bust. Hospitals could even be fined for working together. 4) The Bill undermines the bond of trust between doctors and patients. It creates conflicts of interest where financial incentives could interfere with medical decisions. GPs could even get bonuses for rationing your care. 5) The Bill is wasting money and creating bureaucracy. It is unforgiveable to spend £2 billion on a reckless re-organisation when the NHS needs every penny it can get for patient care. Nearly £1 billion is being wasted on pay-offs for managers, only for many of them to be re-employed as consultants. The ‘Drop the Bill’ campaign, at www.dropthebill.com, aims to show the full scale of opposition to the Government’s plans. It will unite patients, NHS professionals and the public in a final rallying cry to expose Andrew Lansley. Ed Miliband’s valiant efforts to bring some substance into political debate must not continue to fall on deaf ears. Whilst stressing what Labour delivered in office he outlined what remained undone and how Labour must change to face up to current and future challenges. Today Ed in his speech at the Oxo Tower was right to focus on the need for a living wage. The coalition Government doesn’t seem to recognise at all that we have a working poor in this country. Lib Dem-Tory cuts to tax credits will make the situation worse for many and Ed is absolutely right to highlight this. During his election campaign Ed spoke with carers in my constituency and promised to highlight the problems that low wages cause. He has continued to champion their cause and should be given credit for this. I am also glad that today he reminded everyone what Labour achieved in government. New schools, new hospitals, low waiting times for operations and economic growth. We made mistakes of course and I for one was very frustrated at our lack of attention to growing inequality. That is tragic but it does not make everything we did in government wrong. Sensible commentators know that whilst we should have regulated the banks more the recession was largely due to wider international issues. But he is right that we need a new approach in these changed times. Lib Dem-Tory economic policies simply aren’t working especially in areas like the one I represent which is experiencing rising unemployment and declining incomes. Labour has to be the Party that gives hope especially to young people. Labour needs a new economics, more broadly balanced to include manufacturing and technology. It needs to support young entrepreneurs and really explore what could be achieved by co-ops and mutuals. So his comments about “sharing a vision with British industry of how we pay our way in an ever more competitive world” hits the nail on the head. Whilst he is right to champion the cause of the squeezed middle Labour must also make sure that we retain compassion for the poor. So we need to rethink welfare reform so we don’t go back to the bad old days of the deserving and non deserving poor. I thought Ed showed today that he has a real grasp of the issues facing the British people. He has outlined some interesting ideas and I think he should take time to flesh these out. After all he has time on his side for the moment at least.